a crowd of humans forth coming...game day cooking-and Year of the Pig feasts can be fuss free-using ready made soups-and adding a few ingredients. Start with a high quality ones (OF COURSE). 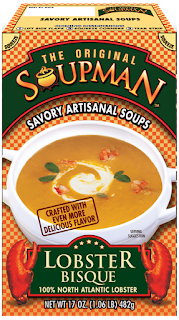 From Original Soupman (yup-that Seinfeld classic)...fav Lobster Bisque is a flavorful, filling perfection of a creamy soup base, spices and chunky tender hunts of lobster. 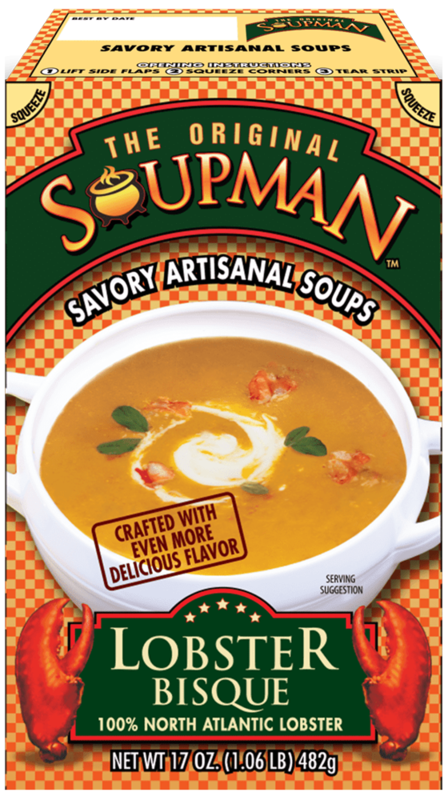 To eat on its own-the Lobster Bisque is addictive awesome. Plus this best seller can be a hearty base for a whole pot of... added shelled shellfish-lobster hunks, crab meat and/or shrimp bits, sautéed onions/celery-till translucent -for added crunch, served with hunks of breads, crackers (try these creative crunches)...or mixed in with some cooked rice. 20% discount NOW AVAILABLE on online orders...delivered in handy 6 pack-12 oz sizes, And other tasty recipes=practically insta-gourmand. For Chinese Lunar New Year-and tail gating liquid warmth-a solid veggie or chicken broth (Pacific Foods-has self stable tasty USDA organic ones), or freezer friendly NONA LIM miso broth-gluten/dairy free/non-GMO---- can be spiced up by adding a teaspoon or two of chili garlic (try Huy Fong-widely available online and at Walmarts, Target etc) or really any sriracha sauce, 2-3 tbsp soy sauce (reg. or reduced sodium) and maybe 2 tbsps rice wine vinegar for salty tart hints, some ground ginger-salt-white pepper (½ tsp-1 tsp each-or more to taste)-to 64 oz of broth (8 cups worth). Simmer up and add in sautéed stemless mushrooms-like shiitaki, cubed tofu or cooked chicken bits...and then slowly pour in- whisked- two eggs-previously stirred up. Thicken up the soup-by taking 2- 3 tbsps of broth and mixing it up with 2- 3 tbsps of corn starch-add it back in-stirring well. A garnish of chopped green onions adds color/and crunch.